Well, it was only a matter of time until I report on the newly-remodeled Hibiscus Bar since I spend much time there when going back and forth between Chicago and St. John. Sadly, this is not one of my favorite bars – in fact it’s one of my least favorite. It’s crowded, the bartenders are agonizingly slow and surly, the food at the cafeteria borders on inedible and the drinks are expensive. Stay Left. 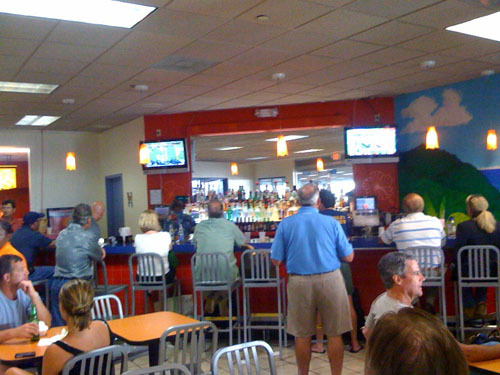 Sit on the left side of the bar as the cash register is there and the bartender seems to never get to the other side of the bar to help people. Instead, he takes an order, gets the drink, takes the money, gives the change and then helps the next person behind the first person. As now the first person has his drink and leaves, this repeats itself over and over and the people on the right side of the bar never get served. Double Up. Need one drink? Order two. Need two? Order four. Even if you are sitting at the bar itself, this is a wise strategy as although you may be sitting on the left side – service can still be slow due to all the walk-ups who are sitting in the cafeteria. By the time you get your orders and finish them, you’ll be right at the same time you would be at a regular airport bar with normal service. Get There Early. I mean hours early. You just never know what is going to happen during the process of getting to your plane in the Caribbean. There are so many things to go wrong and usually will that we literally leave our house in St John five hours ahead of time. Granted, we have to take a ferry and a taxi to get to the airport, but once we get there you just never know what can happen. This is also a good reason to stake out your seat at the bar on the left side and never leave until they call final boarding for your flight. All in all I can’t complain too much about the Hibiscus Bar as there is no alternative since it is the only bar in the Jet Terminal. There are no carding statutes, no rules about how many you can order at once, no limit on how much you drink and no regulations to keep you from taking them to go. So, I guess that makes up for slow service and surly bartenders. bald dudes of the islands unite!